Changed the mattress, changed the sleeping position, but the back pain refuses to climb off your back? Maybe it’s time to kick the pillow. When we punch the pillow into a comfortable shape, we often forget its real purpose. The pillow is support to the spine that runs all the way down to your back. This feathery delight that holds your head up also keeps the strain off your back. It’s no wonder pillows are being paraded around with titles like ‘orthopedic pillows’ and ‘chiropractor-approved pillows’. And some of them really help with your spine health. Which is why, we selected the most comfortable pillows for back pain to help end the vicious circle of suffering. How do the best pillows for back pain help relieve your back? Which types of pillows help relieve back pain? Which are the best pillows for back pain? The main function of a pillow is to align your spine in a neutral position from the head to the lower back. In this position, the curves of the neck, back and lower back are lined up properly. In case your head is resting raised or beneath the neutral position, the pressure will radiate from the neck down to your lower back. The best pillows for back pain keep the head level with the spine and avoids the chances of back pain. If you have already injured your back or neck, these pillows remedy the strain you feel on your back. They help stabilize the spine while you sleep and help with the healing process. Some of them may even help you keep your back in the straight position longer through the night. It’s suggested that a person with chronic back pain should place a pillow under the knees or under the lower back. Some of these best pillows for back pain can also be placed in these positions. Curved Feather pillows: This is the most common type of pillow that most folks use. Feather pillows are good unless they are they too fluffy. They may end up raising your head above the equilibrium position. This creates a dull pain in the lower back. Or your head may sink too low and create a strain at your neck. Memory Foam pillows: These pillows are usually firmer than the feather pillows. The best ones are capable of providing enough support without feeling too hard. Most orthopedic pillows usually lie in this category. After lying on it for some time, the pillow adapts to the shape of your head and becomes more comfortable. Lumbar Pillows: These are pillows made of memory foam that go under the back and support it while sleeping. They are either wedge-shaped or curved at the top. They make contact with the lower back and hoist it up without any effort on your part. Knee Pillows: There are pillows with concave cutouts where your knees can fit. You place them between the knees. This helps lower the force on the lower back for supporting the torso. This method of pain alleviation has been recommended by specialist doctors. Lumbar Cushions: These are not sleeping pillows. These are meant to rest behind the back when you sit on the chair or lean against the wall. They fit the curve of the lower back and take the strain off of it to stay upright. Cylindrical Pillows: There are pillows shaped like a cylinder. These are made of foam, shredded foam or beans. They go under the curve of the neck or the knees to relieve the pain in your back. Body Pillows: There are full-body pillows which roughly remind us of a bagel. They support your back, head, knee, i.e. all possible parts. These are especially useful to pregnant women and even people with chronic back pain. In the best pillows for back pain list, we have covered the feather pillows and memory foam pillows. These are fairly common and easily available. And they can be used under your head while sleeping. Support: We checked the firmness of the pillow against the comfort it provides. It should be firm enough that the head doesn’t sink into the pillow. This way the spine stays aligned in a straight line. The best pillows for back pain help you rest your back more neutrally. Comfort: We picked firm pillows. But they should not be so hard that it makes you uncomfortable at night. We ensured we picked the best pillows for back pain such that they make a soft contact with your face. And that they don’t carry any permanent foul order or an allergen agent. Shape: The best pillows for back pain come in different shapes. Apart from the normal curved and flat foam pillows, we have included contoured pillows of different shapes. Some of them have an indent that helps keep your head staring up and encourage sleeping on your back. Features: The best pillows for back pain offer a number of other features like complimentary pillow case, Bamboo covers, double-sided contours, set of two etc..
Price: We picked the best pillows for back pain from a wide range of prices. We compared them based on their value for money. Whatever your budget is, we want you to get the best for your money. 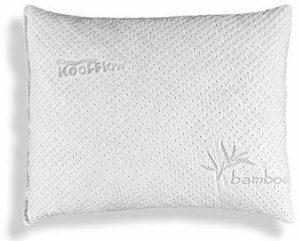 Snuggle-Pedic Bamboo Shredded memory foam pillow has the comfortably familiar design of your old feather pillows. But it’s loaded with technology left right and center meant to keep the pain off your back. With some cool customization options, any one of us can find our perfect fit with this pillow. The standard sizes make sure it fits on any type of bed. It is safe and hygienic and made in the USA. The top-notch quality earns it the top place in our best pillows for back pain list. 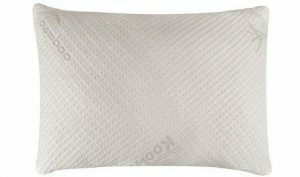 The Snuggle-Pedic Bamboo Shredded Memory foam pillow is looks like a curved pillow that we generally use. But instead of feathers, it uses high quality shredded foam inside. It is available in standard, queen and king sizes. The foam is filled inside a plain cover. It is topped with a Kool-Flow Bamboo cover, all of which are manufactured in the USA. The foam used is eco-friendly and Certipur US-certified. It also weighs very less owing to the proprietary technology of the manufacturer. Both the covers of this pillow for back pain have zippers on the side. You can open them and remove foam to make the pillow flatter. Snuggle-Pedic also offers a very thoughtful customization policy. You can return the pillow up to 2 times without any transportation charges to them for customization. 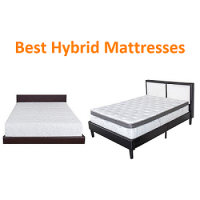 Once you tell them your specific requirements, they can change the weight, consistency, thickness, firmness, support and even the springiness of the pillow to your taste, all at no cost. They will even add the right amount of foam to your taste. The Bamboo cover of the Snuggle-Pedic pillow for back pain is a highly breathable micro-vent cover. Its polyester and lycra construction keeps it feeling soft for your face. It remains cool throughout the night. If you slip another cover over it, it will cut down some of the circulation. It is fully removable and machine-washable. The pillows itself is hypoallergenic and dust mite-resistant. The foam is certified for zero use of any harmful chemicals and heavy metals. It has extremely low VOC so you won’t notice any heavy odor from it when it first arrives. The concept of using shredded foam is what makes Snuggle-Pedic the best pillow for back pain. This material is firmer than the feather pillows. But it’s not as hard as some memory foam pillows. People who absolutely cannot reconcile with solid memory foam pillows should give this one a try. Between the material and the customization, you are bound to find the perfect size which will ease your back pain. You can reduce the filling and use it to hoist the back of your knees or your calves. The customer service of the manufacturer is very helpful in terms of guiding you through the usage. The Oxa Spring Pillow for back pain uses a brand new technology to remain firm without compromising on comfort . This is a spring-based pillow that remains fluffy even after years of use. Migraine and back pain sufferers have used it to remain pain-free after a good night’s sleep. It builds breathability into the design like it’s second nature. In spite of the breakthrough technology, it is only moderately priced. There’s one too many reasons to have it on the best pillows for back pain list. The OXA Spring pillow for back pain is a buff curved pillow. It is available in three models: soft spring pillow, firm spring pillow and the regular pillow. We are reviewing the firm spring pillow because we believe it provides the best support. It uses a unique combination of spring and dense foam for a pleasant amount of buoyancy. It is best suited for people with large and heavy heads. It measures 26” x 16.5”. It should spring up to 7” height after being removed from the packaging. The core of this pillow has 40 inner coils that are wrapped separately. They respond individually to your every movement. So no matter how much you toss and turn, you won’t feel any imbalance of pressure. And no, the springs do not make any creaking noise while you turn your head. Whichever way your head is positioned on the pillow, it provides proportionate firmness. The springs ensure that the pillows will not go flat with continuous use. This is a new technology that’s still pending patent. As per testing, after 50,000 pounding cycles, the pillows lost only 9% of their volume and 6% of their softness. Anybody used to feather pillows that flatten out in no time will know these figures are excellent. The manufacturer is so sure of its design that they offer a 20-year warranty. The sides of the pillow have 3D spacer mesh. As you place the weight of your head on this pillow for back pain, hot air rushes out through this mesh. It is quickly replaced by cool air. Even if you lay on your stomach, the pillow offers excellent air circulation and keeps your head cool. The pillow should not be washed, so you can slip a cover over it. The Oxa Spring pillow for back pain offers the support of memory foam pillow without its unusual firmness or lack of breathability. The spring system keeps the backbone properly aligned and reduces the potential of any back pain. But it feels softer and more compliant than a memory foam pillow. People with big head will find better support with the firm spring model. Others should try the regular Oxa pillow. It has an indent in the center that keeps your head facing straight ad promotes back sleeping. The air circulation is an added advantage for stomach sleepers. The sides of this pillow do not rise and try to choke you if you lay face-down on it. When it comes to spine health, memory foam pillows are golden. The Sleep Innovations Cool Contour memory foam provides two shades of neck support which helps keep your back out of any soup. The therapeutic design of this pillow is widely lauded for relieving neck and upper back pain. It is one of those memory foam pillows that feel comfortable in spite of its supportive firmness. The quality design ears it a high spot on the best pillows for back pain list. The Sleep Innovations Cool Contour memory foam pillow has a double contour design. It is a rectangular piece with two ‘waves’ on two edges. One edge has a shorter wave and the other side has a higher wave. People with smaller neck curve should use the former and those with longer necks should use the latter. It is available in Queen and standard sizes. This is made of memory foam made in the USA. The Sleep Innovations pillow is not one continuous piece of foam. It is two pieces fused together. One part helps keep your head cool throughout the night. It allows proper ventilation even when you lie on your stomach. The other part is the curved memory foam where you place your head. It comes with a soft removable microfiber cover. You can wash this cover separately. This pillow for back pain is hypoallergenic. You can safely place your face on its soft surface. You cannot machine-wash it. But it can be spot-cleaned if you notice any blemish on it. We didn’t notice any strong chemical odor from this memory foam pillow in the first use. Given the material, it holds its form even with continuous use. But we are a little concerned about the way the two pieces of foam are stuck together. This is a weak link in the durability of the design. But when bought from trusted sellers, this pillow seems to hold up well. Price-wise, it lies in the moderate range. If it lasts through your serial abuse, it performs as well as pillows thrice its cost on all other aspects. Memory foam pillows offer the best support for neck and upper back. But you need to get used to their firmness compared to regular feather pillows. 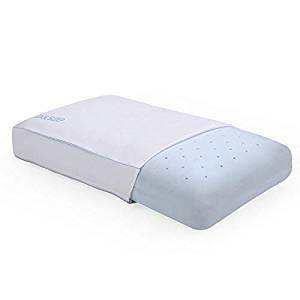 Once you spend 3-4 days sleeping on the Sleep Innovations Cool Contour pillow for back pain, you will find your neck doesn’t get stiff after a full night’s sleep. Use the contours smartly based on the neck length. Properly-rested neck eases the stress on your upper and lower back. The Cr Sleep Memory foam contour pillow is the supportive embodiment of quality in pillows. This memory foam pillow keeps your head supported without compromising on you air supply. Built with high-quality materials, it is completely safe for a home environment. 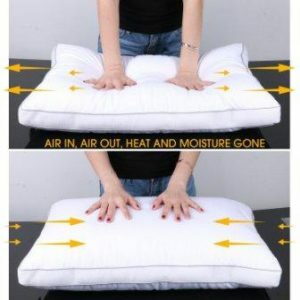 Its removable covers make it easy to keep the pillow clean and hygienic. The gel-infused technology upholds the head without creating any pressure. Cr Sleeps rolls right over to the best pillows for back pain list. The Cr Sleep Memory foam contour pillow is double-side curved pillow. The sleeping surface has a two-crest formation. One side has a shorter curve at 3.5 inches and the other side has a larger curve at 4.5 inches. The shorter side can be used by people with smaller necks. The pillow measures 24 inches in length and 16 inches in breadth. This pillow for back pain uses gel-infused memory-foam. The Air-cell technology allows air to move in and out of the pillow and keeps it and your face cool. When you apply force on the foam, it leaves an impressions and this portion adapts to the shape of your body which rests on it. The foam is Certipur-US certified for safety. It is also anti-microbial and hypoallergenic. No harmful chemical went into making this pillow. You can rest assured it is safe for use right out of the box. If there is any fain chemical odor, it can be aired out over a few days. The Cr Memory foam pillow comes covered in a jersey cover and an outer polyester-tencel cover. The Jersey cover protects the pillow while keeping it open for air circulation. The removable outer cover zips over it. You can machine-wash the pillow case at your own risk but we would definitely avoid putting it in the dryer. The pillow promotes good airflow compared to similar memory foam pillows. The Cr Sleep Memory foam contour pillow walks a thin line between support and comfort. The foam is firm enough to be supportive to your head and to keep the spine neutral- But it’s not so firm that its feels uncomfortable. Most people will find no break-in time with this pillow. We got used to it right away. But if you are making the shift from feather pillows, you might require some practice. It provides ample support for both back and side sleepers. Xtreme Comforts Hypoallergenic pillow lives up to its name in every sense. This is a shredded memory foam pillow that keeps you coolly comfortable through the course of night. It has the best customization options to go with the comfort. The fact that it can be easily placed under the back or under your knees makes it a versatile pillow. The convenience of being machine-washable is invaluable. The Xtreme Comforts adjustable pillow for back pain is of the curved type. It arrives flattened in a plastic wrap. Once you have removed the wrap, the pillow gradually bounces to full size. Some folks may find the fluffed version too overstuffed. But this is done on purpose. This is an adjustable pillow. So you can manually reduce the filling and make it as firm as you require. It is overstuffed to cover the needs of a wide range of people. This pillow for back pain is bag of shredded memory foam. This material is quite comfortable to lay your head on. It doesn’t feel as hard as a continuous piece of memory foam. But it is firmer than the feather pillows. This is Centipur-US certified foam. This indicates that it’s not made of any harmful materials like chemicals or heavy metals. It is available in standard, queen and king sizes. There are two covers on the Xtreme Comfort pillow. One packs the shredded foam and the other goes over it. Both have zippers on the side through which you can adjust the amount or distribution of the foam inside. The outer Bamboo cover is microvented to promote free air circulation. The entire pillow is washable. In fact, if you notice that the pillow is flattening out a bit, put it in the washer. It will fluff right back up. The pillow is hypoallergenic and dust mite-resistant. It is also mold-resistant. The Xtreme Comforts adjustable pillow for back pain straddles a very precise balance between firmness and comfort. It is quite supportive like the Snuggle-pedic. It helps keep the back aligned no matter which side you sleep on. But it doesn’t feel like you’ve placed your head on a shelf like many memory foam pillows. This pillow is good for all types of positions: back, side and stomach sleeping. The cover ensures that you are able to breathe freely. 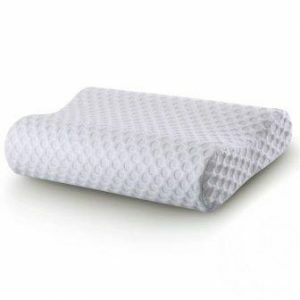 The Classic Brands Cool Sleep memory foam pillow is a godsend for people with back pain. The new shape perfectly supports the neck, back and shoulders. This is good quality memory foam which keeps the airflow open throughout the night. The firmness of the pillow keeps your head level with the spine. It is available in a number of sizes and fits easily inside a normal pillow case. 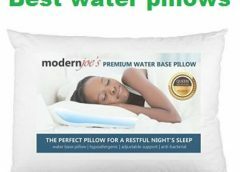 It is an exciting find, especially for the side sleepers, for our best pillow for back pain list. The Classic Brands memory foam pillow is a continuous piece of memory foam. The king size measures 33 inches in length and 16 inches in breadth. It is 6 inches in height and compresses maybe 0.5 inches when you lay your head on it. This is an excellent height for side sleepers. It is also available in Queen and Standard sizes. This pillow for back pain uses gel-infused memory foam pillow. It is a rectangular piece of foam with a slight curve on the top face. It does not have the contours of Cr sleep pillow. Once you place your head on it, it sinks into the alignment line with your spine. The open-cell technology of the pillow makes it easy for air to flow through it unlike closed-cell technology. As a result, your head/face remains cool for a longer period in the night. The pillow is gusted on the side to help both back and side sleepers maintain the right posture. The Classic Brands memory foam pillow comes with a removable cover. It can be washed in the machine. This soft cover will also wick the moisture from your neck and back as you sleep. The foam is antimicrobial and anti-allergenic to mold, bacteria and dust mites. There’s a mild odor to the pillow. It needs to be aired out before you use it. We would leave it off for a couple of days in a well-ventilated place. Most memory foam pillows have a contoured body. People whose necks do not adapt well to this contour do not find them comfortable. This rectangular pillow might be much easier to use for them. The shape is more familiar and the foam adapts to the curve of your neck easily. The pillow is medium plush, so it does not pressure your head at the back. It feels soft to both side and back sleepers. The Arc4life Cervical Linear Traction pillow is meant for anyone who deals with chronic back, neck and shoulder pain. The special design aims to cradle your head in the right position without making it uncomfortable for your shoulders or neck. This is not a foam pillow, so you wouldn’t have to worry about too much firmness. The soft hypoallergenic feel works for all types of users. This is a pillow worthy of the best pillows for back pain list. 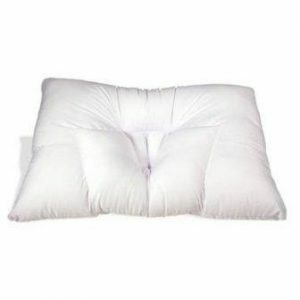 The Arc4life Cervical pillow is a fluffed mass measuring 24 inches in length and 17 inches in breadth. It stands around 6-7 inches high from the bed. This is an expensive pillow but it can prove to be therapeutic to someone who has suffered constant pain in the upper and lower back areas. This pillow for back pain has V-shaped contours on one side. The well of the V has an indent where your head lies. This indent keeps the head at a neutral position with the spine. This provides traction to the neck and relives pressure at the curve. This, in turn, keeps the lower back relaxed. In case you want a break from the V-shaped traction, you can try the opposite of the pillow. The neck roll here offers firm support to the curve of the neck. Since the Arc4life cervical pillow is not made of memory foam, it is more breathable. You can sleep sideways without feeling like you are being choked by your own pillow. It is machine-washable too which is a blessing in disguise. Being non-allergenic, it is safe for the household. It comes without any chemical odor. The Arc4life Cervical pillow is an excellent alternative for memory foam pillows. Some of us just don’t like the feel of memory foam. But Arc4Life feels soft yet supportive. The design itself promotes straight sleeping and keeps the head properly lined with the spine. The choice of neck roll on the other side is much-appreciated who wants to avoid potential neck problems. Not everyone can get used to the shape of this pillow. But we suggest that you give it 3-4 days’ time to break in. Even the folks who didn’t find it comfortable said it improved their sleep. The EasyLife185 ergonomic pillow does make the life of chronic pain bearers much easy. The ergonomic design of this pillow is specially equipped to keep your neck comfortable. Folks who injured their neck or back in accidents and spondylosis patients have found it very helpful. Its performance speaks for it right into the best pillows for back pain list. The EasyLife185 Aloe memory foam pillow has an innovative new shape. It has a heart shaped area with an indent in the middle. This space cradles your head. The sides of this heart are slanted. So it makes a convenient place for placing your hand. This provides therapeutic support to your vertebrae and keeps the strain off your back. The King size of this pillow is 25 inches long and 14.5 inches wide. On the lower side the pillow is 4.3 inches high and on the higher side its 4.7 inches high. As a side sleeper, you can even use the higher side to place your head. This pillow for back pain is made of slow rebound memory foam. It rebounds from its sunken shape and hence enjoys a longer life that most memory foam pillows. It is covered in an anti-mite inner sleeve. The aloe pillowcase is soft and breathable at night. This pillow case is removable. It can be machine washed. From experience with the pillow, we know that it’s surprisingly breathable. The revolutionary design of the EsyLife185 Aloe memory foam pillow has found favor with many people. It has greatly helped those with who have grappled with lower back pain for long. The heart-shaped indent does support the back and neck quite well. The Mkicesky memory foam pillow for back pain takes inspiration from the nature to give you a pain-free night of sleep. The firm memory foam is like therapy to the back of many users. The Bamboo cover makes it more breathable than usual memory foam pillows. It has an odd shape that needs some getting used to. But it impressed us enough to earn a place in the best pillows for back pain list. The Mkicesky memory foam pillow is shaped like a butterfly to help adapt to your body. The neck roll area juts forward a little providing support to the entire curve of the neck. This area also has a slight indent which allows you to rest your head in line with the spine. You can move from side to side without feeling like you have sunken into the pillow. Both back and side sleepers will benefit from this pillow. This pillow for back pain is made entirely out of a solid piece of slow rebound memory foam. It is firm but just enough to provide support to your back. The foam doesn’t lose its springiness fast. The pillow is wrapped in an inner cover with an outer Bamboo cover. Both are removable and washable. The pillows run 24 inches long, 14 inches wide and 4.3 inches in height at the higher side. It is 2.4 inches on the lower side. It needs to be aired out upon arrival. 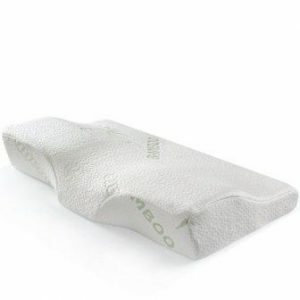 The Mkicesky memory foam pillow offers the firmness that keeps the neck well-supported. Deep down it impacts the back positively. From painful migraines to back pain, all kinds of patients have found an improvement after using this pillow. The Sleephi Collection hypoallergenic pillow is already a blessing in disguise for people with neck pain. It is much better than a down pillow that flattens with a few uses. No matter how much you loll around at night, the design ensures that your head remains neutral to the spine. This kind of talent deserves a place in the best pillows for back pain list. The Sleephi Collection hypoallergenic pillow is filled with microfiber filling. It has an indent in the center where your head rests. No matter which side of the pillow you use, your head rests securely in this area. The standard pillow is 20” x 26” and the king size is 20” x 36”. Both the sizes are luxuriously large to fit heads of any size. Because of the microfiber filling, it is soft. The design makes its supportive enough to relieve any back pain. This pillow for back pain is washable. The best solution is to take it to the dry cleaner though. The pillow is a bit thicker than many people are used to. But if it’s positioned correctly, the neck roll will align correctly with the neck. But if you have a small neck, you should go with a memory foam pillow which is more likely to end to the curve of your neck. The Sleephi Collection hypoallergenic pillow has a unique design. A bunch of cervical troubles find their solution in it. The neck roll keeps the neck in alignment with the spine. The indent is accessed the same way from all sides. Even if you thrash around in the bed all night, you can still have the spine in neutral position with Sleephi pillow for back pain. The TruContour Lumbar Pillow for Sleeping Back Pain – Support the Lower Back in Bed with Medical Grade Memory Foam is a highly advanced pillow used by people who suffer from back pain. It has been designed to support the spine and improve its posture. This leads to a reduction of strain in the back muscles as well as the ligaments for people who not only sleep on their backs but for those who sleep on side or the stomach as well. The foam used in this mattress is medical grade memory foam and it offers a nice balance between comfort and support. It is also dust resistant and hypoallergenic. The outer cover made out of velour is extremely soft and is machine washable. The cover has got an inner mesh liner which is highly breathable and is of premium quality. The TruContour Lumbar Pillow for Sleeping Back Pain – Support the Lower Back in Bed with Medical Grade Memory Foam has been developed as an innovative product which increases the comfort while sleeping and resting. The pillow has been designed to help the human body maintain its natural shape and as such functions as a ‘true contour.’ The product designing is based on evidence emanating from medical sciences and has inputs in designing from physicians who are board certified. 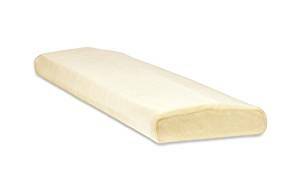 The TruContour Lumbar Pillow for Sleeping Back Pain – Support the Lower Back in Bed with Medical Grade Memory Foam offers two different levels of lumbar support. These are the Light and the Super Lumbar. The Light model has been designed for those people who require either small or moderate level of support. The Super Lumbar, on the other hand, has a wide range of support to offer. It gives anywhere from light to substantial support. In fact, it is built with two different layers which are two different foam pieces having different thicknesses. The total height then becomes adjustable as one of the foam pieces can be removed. The dimension applicable to Light Lumbar is 17 x 8 x 1.75 in. while the ones for super Lumbar are 24 x 8 x 3 in. For those people who sleep on one side, the sleeping position causes the vertebrae to acquire an unnatural position leading to strain on muscles and ligaments. By placing the support pillow beneath to raise the lower back aligns it with the rest of the spine this relieving the pressure. For those people who sleep on their backs, gravity ends up pulling the lower back and tends to flatten the lower back which causes discomfort. By simply placing the support pillow under the lower back restores the shape of the spine. The people who sleep on their stomach are also supported by this pillow. The cover provided is machine washable. The light lumbar pillow might appear too tight for some people. The gusseted edge design of this Cervical Support Pillow from Nature’s Guest, Doctor recommended contour design, fully adjustable, helps reduce neck and back pain, Hypoallergenic, improves cervical health boasts an altogether new type of microfiber filling, a silk gusset trim and a superb cotton fabric cover. These allow for a higher level of airflow and helps the person sleeping to have a great full night’s rest without any disturbance. While most pillows are made out of polyurethane (memory foam) which could result in respiratory as well as skin related issues for many people. Nature’s Guest pillows are made out of materials which are hypoallergenic. This leads to harmful chemical doors or allergic reactions. 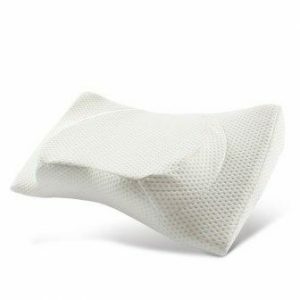 The gusseted edge design of this Cervical Support Pillow from Nature’s Guest, Doctor recommended contour design, fully adjustable, helps reduce neck and back pain, Hypoallergenic, improves cervical health for side and back sleepers permits the users to change sleep positions for a very restful whole night’s sleep. This pillow is not recommended for those people who sleep on their sides. It is quite hard to choose a good pillow and every person has his/her own preferences. One feature that might work for one person might not be liked by the other at all. For this reason, the manufacturer allows for a 90-day money back guarantee without any hassles upon return of the pillow. The user is assured that 10% of the price paid by the purchaser would be forwarded to global humanitarian relief efforts. As such, the cervical pillows are different from regular pillows. This pillow contains fillings which are heavier as they provide additional support. Therefore, it is not recommended for individuals looking for a soft and fluffy pillow or for those who love hi-loft pillows. It has been provided with a dual zipper which allows access to the filling. The user can very easily adjust the firmness of the pillows in the neck roll cushion or the side sleeping portion. It can be easily adjusted from soft to medium firmness. The Cervical Support Pillow from Nature’s Guest, Doctor recommended contour design, fully adjustable, helps reduce neck and back pain, Hypoallergenic, improves cervical health for side and back sleepers has a pending patent and is recommended by both orthopaedic doctors as well as chiropractic doctors. It contains a neck-roll cushion that has been built-into the pillow which helps in providing optimal cervical support to those people who sleep on their back. inches. It helps to reduce neck pain as it provides a high level of cervical support to the neck which helps to maintain the proper neck, head and spinal alignment as the user sleeps throughout the night. The edge design which is gusseted helps those who sleep on their sides and provides an optimal level of support for back sleepers. The pillow cover allows for high breathability. Recommended by orthopaedic and chiropractic doctors. Ideal for sleepers who shift from back to sides. The Coisum Orthopaedic Memory Foam Pillow, Cervical Pillow Contour Pillow for Neck and Shoulder Pain, Neck Support Pillow, with Hypoallergenic Pillowcase, Ergonomic Bed Pillow for Side Sleepers, and Back sleepers are a premium quality pillow with memory foam which keeps the pillow medium firm. The pillow is ideal to lower the neck and shoulder stiffness and pain. The pillow has been designed in such a way that its slope helps to protect the user’s head from rolling. The pillow also boasts cut-outs on its sides which allow the user to put his/her top arm in a restful position and does not allow the shoulder to hunch over in front of the user. 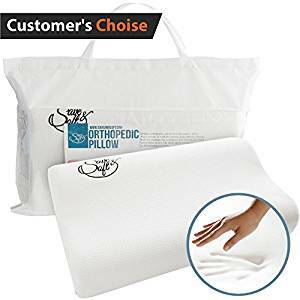 The Coisum Orthopaedic Memory Foam Pillow, Cervical Pillow Contour Pillow for Neck and Shoulder Pain, Neck Support Pillow, with Hypoallergenic Pillowcase, Ergonomic Bed Pillow for Side Sleepers, and Back sleepers has product dimensions of 24.4 x 15 x 4.7 inches and weighs only 3.4 lbs. It provides premium quality sleep to its users as a result of its amazing neck-support design. The pillow has been designed by the manufacturer with a strong focus on Ergonomics. The pillow has been made out of slow-rebound memory foam. It has the capacity to absorb cervical pressure and provides stress-free sleep to the user. It has been designed in such a way that its height is just ideal for back sleepers, side sleepers as well as stomach sleepers. The two long edges of the pillow have lower access and this feature prevents the user from falling off the pillow. It also reduces the tossing and turning on part of the user. The slopes on these edges make the pillow match the cervical curve and this feature is ideal for keeping the user spine in a natural state of the curve. This results in very deep sleep for the user and allows them to breathe easily as their throats are not pressed in any way. The pillow has been designed in an aesthetic way and it is both hypoallergenic and highly breathable. It allows for increased airflow and thus keeps the pillow and the user cool and at the same time reduces wrinkles which are produced when the user sleeps on one side. The pillow has the shape of a Butterfly and it has been designed to provide adequate support to the back sleepers, stomach sleepers as well as the side sleepers. The higher side of the pillow has 2 horns to enable a higher level of support for the head and the cervical area. This leads to a proper alignment of the neck with the rest of the user’s body. This feature helps the back sleepers who have some cervical issues to consider. For the rest of the back, side and stomach sleepers, it has been provided with a cut-out area so that they can position their arms as they desire. The pillow is highly ergonomic. Takes a few days to adapt to the pillow. The Memory Foam Pillow – Comfortable Hypoallergenic Pillow with Micro-Vented Soft Removable Washable Cover, Optimum Neck Support & Pain Relief, Ideal for Back, Side Stomach Sleeping is the ideal pillow for a deep rest and comfortable sleep. It has been made out of premium quality materials which do not have produce any harmful or allergic type of reactions in the users and boasts a high level of protection against such irritants as dust, mites and mould. 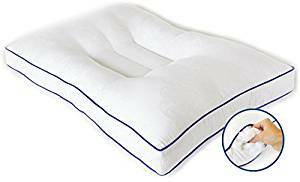 The memory foam used in this pillow adjusts itself to the body of the user and attains and maintains the proper form throughout the night ensuring a very sound sleep. This high-quality pillow contains memory foam that totally eliminates any kind of a pain in the shoulders as well as in the back and neck of the user. The head and the spine get aligned properly while the user sleeps and this allows for a very fresh and cheerful feeling when the user gets up in the morning. The user would not feel any kind of a pain in the back or neck when he/she wakes up. Every individual has a different style of sleeping and mostly it is on the back, stomach or on the sides. This pillow serves the users in any position of their preference. With the help of this pillow, the user gets to have an extremely high-quality sleep in a comfortable manner. There is absolutely no need for the user to change the sleeping habits. The user does not have to adjust to the pillow. The pillow adjusts to the user. 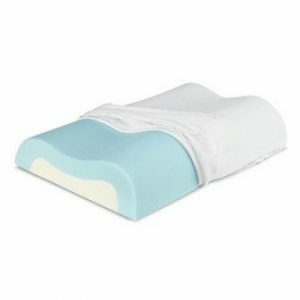 This Save&Soft memory foam pillow is packed i a removable case which is both soft and removable. It is made out of material which is very soft and is very pleasant to touch. In order to clean the case, it is simply a matter of removing it and machine washing it. In case, the memory foam pillow gets a stain, it can be easily cleaned with a sponge and water. This pillow can serve as a great gift for friends and relatives. For the sake of their health and happiness, it can be gifted to them so they can enjoy its beneficial health effects and enable them to have a good mood throughout the day. It helps you cater to the rest and sleep requirements of people that are close to the user. 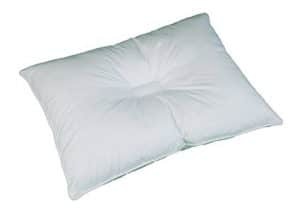 The unique design of this Memory Foam Pillow – Comfortable Hypoallergenic Pillow with Micro-Vented Soft Removable Washable Cover, Optimum Neck Support & Pain Relief, Ideal for Back, Side Stomach Sleeping as well as the memory foam as its filling supports the spinal position while sleeping and it lets the back of the user as well as his/her neck and shoulder muscles totally relax enabling a full night of undisturbed and peaceful rest. This 5. 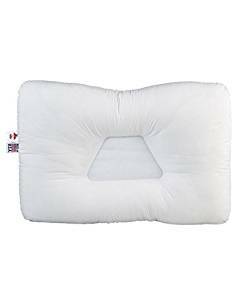 FIB-222 Tri-Core Cervical Pillow from Core Products, Gentle Support, Midsize, White is the bestselling pillow from Core Products. It is popular for its effectiveness in ensuring that the spine and the neck are perfectly aligned in the natural position as the user sleeps throughout the night. This pillow, being the most requested pillow from the manufacturer is a Tri-Core orthopaedic pillow that is able to provide soft support and it is also able to last much longer as compared to traditional pillows. The centre of the pillo0w which is shaped like a trapezoid act as the main support of the pillow and offers many orthopaedic benefits to the sleeper. It gently cradles the head and very firmly supports the neck keeping the user extremely comfortable throughout the night ensuring a very sound and deep sleep and a very fresh and exhilarating user upon waking up in the morning. The pillow comprises two different sized lobes which offer a wide range of support to different users of different sizes thus covering all types of sleepers. Side lobes are utilized by those sleepers who sleep on their sides as these are taller. The pillow also contains highly resilient fibre that has the capability to spring back when it gets compressed. This provides an exceptionally high level of comfort as well as durability to the pillow. The cotton cover which comes with this pillow is highly breathable and is extremely soft to feel and touch. The pillow fits a standard pillowcase of dimensions 24″x 16″. The product dimensions of the pillow are 22 x 15 x 4 inches and it weighs as little as 1.4 lbs. The pillows made of fibre are specially designed with the neck and the back of the user in mind. The user has the choice of selecting between the Standard Tri-Core Pillow or the Gentle Tri-Core Pillow with the latter having a slightly less quantity of fibre as well as having a reduced height. It must be noted here that for all those users who are not accustomed to cervical pillows would need some time to adjust to such pillows. This happens as the pillow gets into action in order to help restore the cervical curve properly during the time the user is sleeping. The Tri-Core Full-size pillow is 24×16 inches, the Midsize pillow (Mid-Core) is 22×15 inches and the Petite-Core pillow is available as a pillow of 19×12 inches size. The pillow boasts 2 neck rolls of varying width which are located on the top and bottom part of the pillow. 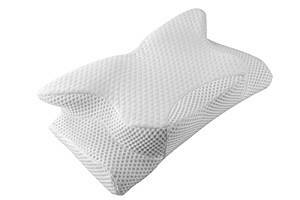 These enable a perfectly customized fit for various users of the pillow who have different heights and weights. The centre of the pillow is trapezoid shaped and it offers great advantages to the sleepers which are orthopaedic in nature. This is especially true for back sleepers as the pillow cradles their heads and allows the onboard neck-rolls to give firm support to the neck part of such users. For side sleepers, there is a great advantage as well. There are side lobes on the pillow which are firm but still very comfortable and these are instrumental in supporting the head of the users in a natural position as they sleep on their sides. The pillow has a choice between the standard and the gentle versions. The pillow is ideal for back sleepers as well as side sleepers. It takes some time for a new user to adjust to the cervical pillow.